What happens at an AURA-SOMA® consultation? After explaining to you a little about AURA-SOMA®, and answering any questions you may have, I let you enjoy the peace that comes from being in front of the Equilibrium bottles. 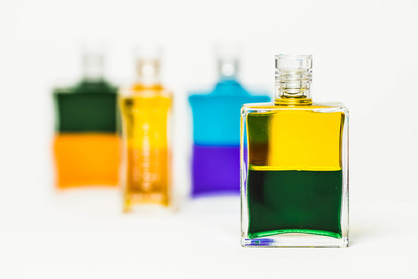 If you wish, you can choose to experience the calming and cleansing effect of a colour pomander in your aura before and after choosing your bottles. This also allows to fully arrive in the Aura-Soma space and be fully present to the beauty revealed during the consultation. As Vicky Wall used to say, “You are the colours you choose and these reflect your being’s needs.” The pomander colour you are drawn to using is always what you need. Then, connecting with your own intuition, you choose four bottles. The consultation is based on your bottle choice. When you look at the colours, your subconscious mind knows what colours will be supportive to you at this time. Choosing four bottles from a selection of “Balance” bottles helps to reveal the real you, as every colour and bottle combination has a specific meaning. This makes the bottles powerful tools for transformation. Your choice of bottles tell a practitioner about your life’s path, your personality, what drives you and what’s holding you back. Through the awareness of how we respond to certain colour vibrations, we can recognize where we stand in relation to particular colours or issues. Can we see something in ourselves we would like to change, or like to nurture, explore and expand? The bottles show the gifts and talents you have and how you can utilise these to transform situations in your life and help you move forward with confidence. Each bottle can be seen as a key to consciousness. What is wonderful is that you arrive at the consciousness through your own intuition - not through the consultant’s – and there is an emopowerment in this process. Choosing the bottles helps us to connect to the very essence of our soul, helping us to recognise and understand our own essential nature. After a consultation, you can choose to use one of the four bottles from your reading. To work with an Equlibrium bottle: the beautifully-smelling oil is shaken and massaged into the skin on the relevant energy centre or chakra of the body, helping to restore, revitalise and re-balance all levels of being. 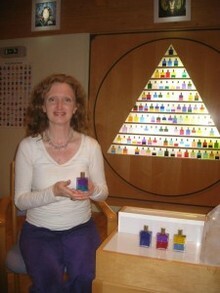 There is an affirmation to use with each bottle, and it is a wonderful journey of self-awareness through colour. Caroline has been exploring alternatives for holistic living since 2000, training in many holistic therapies including Reiki, Shamanism and Angelic Healing. She specialises in Aura-Soma as it marries her love of the colour, plant and crystal kingdoms.